This is the official egg-site of Charley chicken, the Serious Fowl . . . a friend with a feather for every kind of weather. 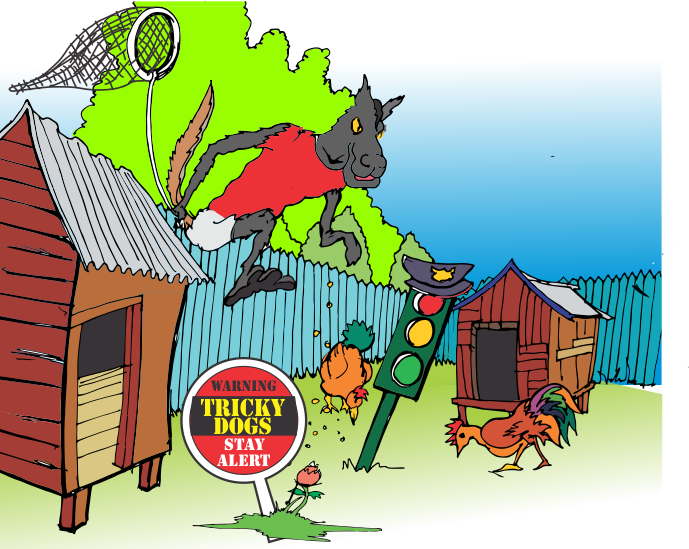 (Click here to become Charley Chicken's friend.) You can read, play or crack eggs and crack jokes with other fowl fans without leaving your own coop. Charley Chicken lives in a neat little town called Koklokrom. The air is so fresh and there is no rubbish lying around. There's a big lake near Koklokrom and Charley Chicken and his friends like splashing around there. 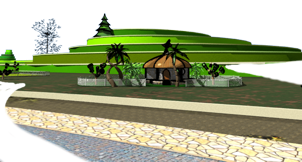 There's also a stadium and an airfield and a railway track also runs through Koklokrom.Click here to go find out moreabout Charley Chickens town and how you can make your neighbourhood as nice as Koklokrom. You can even get your own little coop in Koklokrom! He's the freakiest fowl that you could ever meet. His full name is Charley Koku O'Kuko Chicken and he's a friend for all. Charley Chicken has feathers but he says he is not a chicken. "After all," as he says, "how many	chickens do you know that can read and write?" Charley Chicken is one of the best friends you could have! Sir Basil was one of Charley Chicken’s early ancestors. Basil was an adventurer and discoverer, who led an exciting though brief life. Being born with big brains, he is famous for many famous innovations and finding new ways for Chickenkind to do old things. 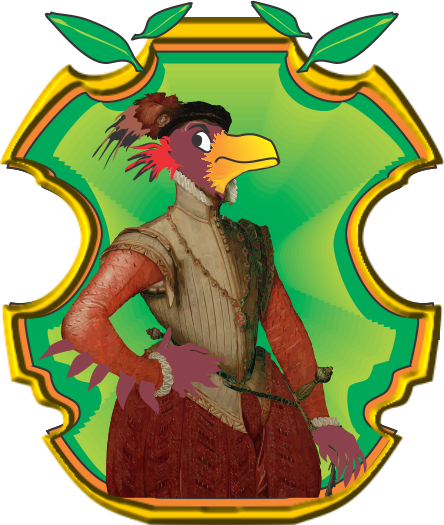 Sir Basil was the first and last son of the Great Original Rooster, and the whole Charley Chicken family is descended from him. "Ay Oga"! "I beg don't come give me wahala here o!" Charley Chicken had a cousin called Oga Akuko, because he called everyone else "Oga" himself. Oga Akuko also said he was from Faraway like GeeKnee Fowl, but it was the other side of Faraway from where GeeKnee came from. Even if he was very plain-spoken and quite loud Oga Akuko is a very pleasant person when you get to know him. 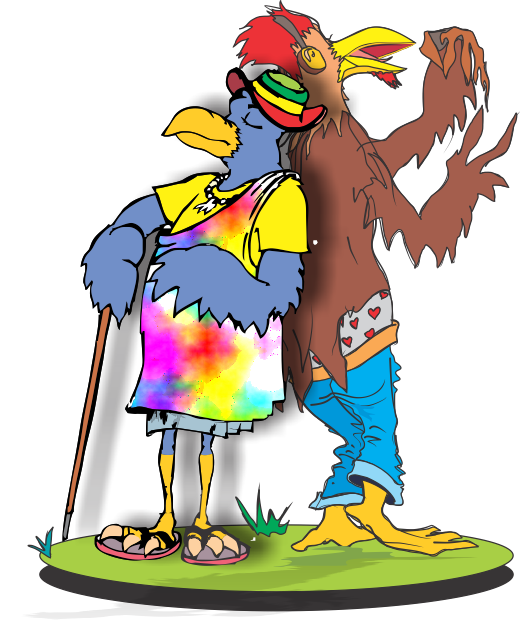 Charley Chicken was looking forward to taking Oga up on his offer to take Charley Chicken to visit his Faraway home. Professor Poppycock is a wise old bird that thinks it's good to know everything under the sun. Poppycock is happiest when he has a difficult puzzle or some twisted riddle to solve. When some frightened fowl was running around telling everyone that the sky would fall on our heads, it was Professor Poppycock who finally calmed everyfowl down. He explained how the sky falls on our heads every minute of every day, but that it doesn't hurt one bit. On this egg-site, Professor Poppycock pops up himself once in a while to remind us to never stop learning, even when we are not in school...but if you just can't wait for the Professor to pop up, just click here and you can help Poppycock with his riddles and puzzles and other brain-twisters! ... wakes up with a muddy nest. 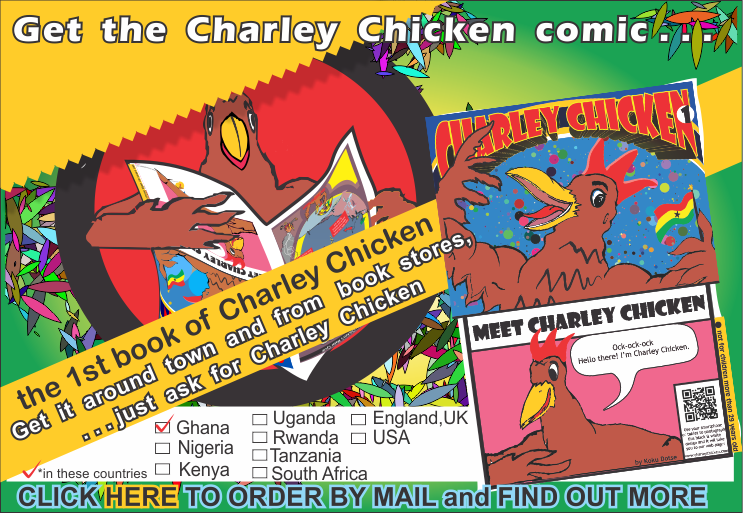 The Charley Chicken comic has 20 richly-coloured pages of lovely pictures and other nice ideas to put into your head. When you get your own copy, there is a poster you can take out and put on your wall. in this first issue, Charley decides to go on a picnic, drink some corn juice, then just lie back and watch the clouds rolling by ... for those days you can't go online or get to Charley Chicken's official egg-site ... and also because there is a lot in there which may not be on this site.if you can't find it to buy anywhere, click on the picture above and you will find out how we can send one to you at school or at home. Some of Charley Chicken's friends are not as nice as Charley Chicken. Meet Gbevu, the bush dog. Gbevu is very sneaky and loves "sharing" what does not belong to him. After you meet him and shake his, er, paw, you should count your fingers to make sure that all six of your fingers are still there (if you count and get only five fingers, Gbevu has probably snatched one already!) People like Gbevu make it very important to learn how to read properly—and carefully, too! You can click here to find out more about this rogue.